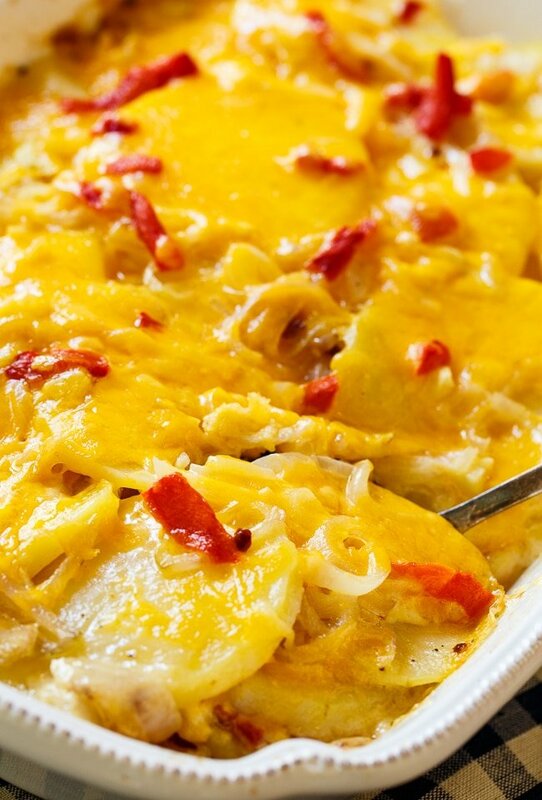 Pimento Cheese Potato Gratin is a creamy potato dish southern-style. 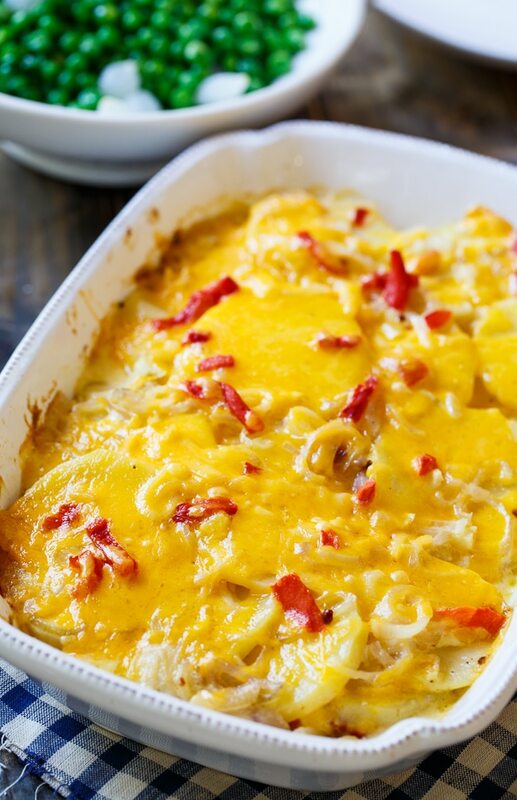 A layer of homemade pimento cheese is slathered between two layers of thinly sliced Yukon Gold potatoes for a super creamy and cheesy potato gratin. Whether it be a holiday meal or a Sunday supper, this potato side dish will be a welcome addition to the table. I love pimento cheese, otherwise known as the Pate of the South, and I’ve tried making all kinds of things with it. Pimento Cheese Pizza, Fried Pimento Cheese Balls, Pimento Cheese Stuffed Squash, and Southern-Style Focaccia are some of my favorite recipes with pimento cheese in them. To make this potato gratin, I sliced and cooked some Yukon Gold potatoes until just tender. I find if they’re not precooked, they take forever to soften up in the oven. I made a homemade pimento cheese with shredded cheddar, sliced pimentos, and just a little mayonnaise to bind it together. I slathered the pimento cheese on top of a layer of potatoes and then covered it with more potatoes. On top I poured a mixture of cream with sauteed shallots and garlic plus more cheddar cheese. Thirty minutes in the oven and I added more cheese and sliced pimentos on top. I firmly believe you can never have too much cheese in a potato gratin. 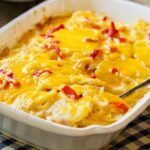 Pimento Cheese Potato Gratin is a fun twist on potato gratin with a unique taste from the pimentos, but it still has that familiar creamy and cheesy taste that everyone loves in a gratin. Note: You can use roasted red peppers instead of pimentos. 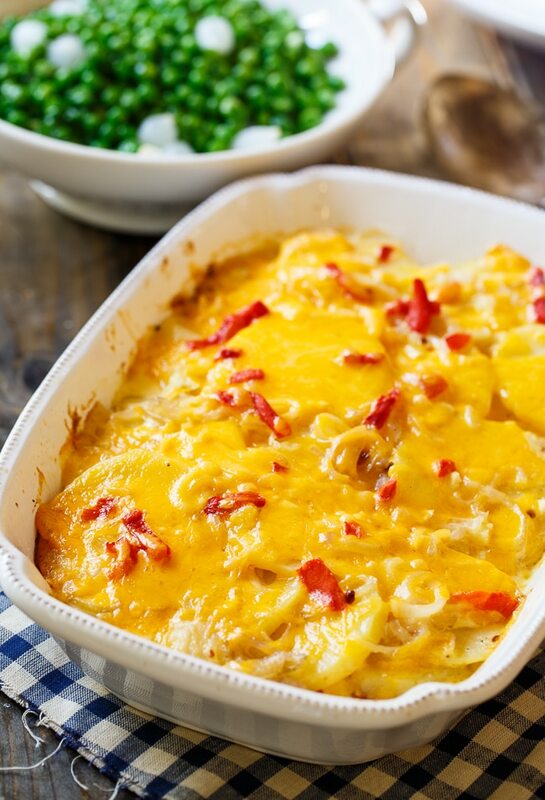 A layer of homemade pimento cheese is sandwiched between two layers of Yukon Gold potatoes to create a super creamy and cheesy potato gratin southern-style. Place potato slices in a saucepan and cover with water. Bring to a boil. Add a few teaspoons of salt to the water. Simmer potatoes until slightly tender, about 8 to 10 minutes. Drain. Melt butter in a pan over medium heat. Add shallots and cook 2 to 3 minutes. Add garlic and red pepper flakes and cook 1 minute. Add cream and bring to a simmer. Remove from heat and stir 1 cup of cheddar cheese into cream until it melts. Set aside. Preheat oven to 375 degrees and grease a casserole dish with butter or cooking spray. 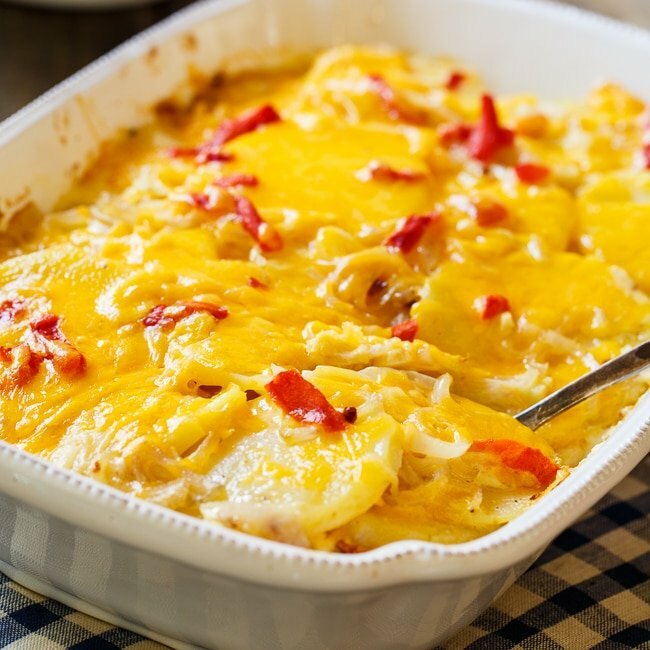 In a small bowl, stir together 1 cup shredded cheddar cheese, mayonnaise, and pimentos, reserving a few of the pimentos to put on top of the casserole. Layer half of the potato slices on bottom of prepared casserole dish. Season with salt and pepper. Spread all of the cheddar/pimento mixture on top of bottom layer of potatoes. Layer remaining potatoes on top of pimento cheese. Season with salt and pepper. Pour cream mixture on top. Cover casserole with aluminum foil and bake for 30 minutes. 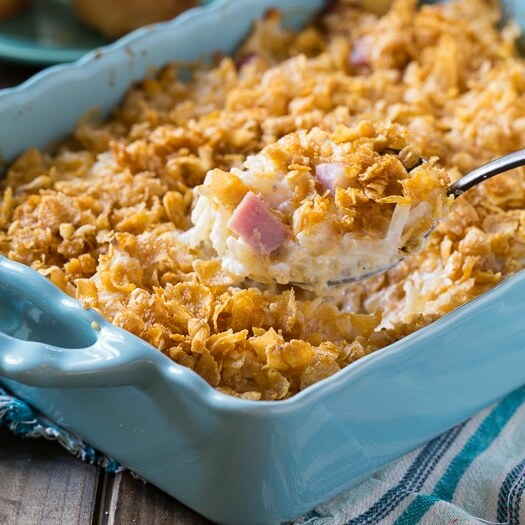 This entry was posted in Casseroles, Side Dishes and tagged casserole, pimento cheese, potatoes. Bookmark the permalink. I don’t think I have ever had pimento cheese! But I love cheese, so I’m sure I would love it! 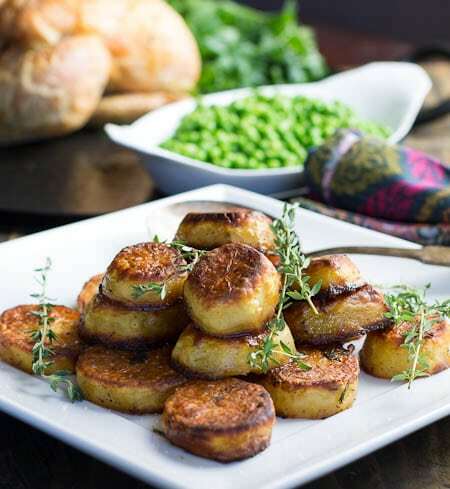 Also Yukon Golds are the best potatoes, so this looks like a total winner! Yum, Christin! I love the idea of pimento cheese gratin. This looks fantastic! Potatoes and cheese! What’s not to love? I’ve never used a jar of pimentos to make anything before, but I think I’ll have to start. This looks so good! Oh my goodness, this is all of my favorite foods in one! I would have never thought of putting pimento cheese and potatoes together but this looks and sounds amazing, can’t wait to try!